In addition to the various objects along the flow Ciliwung, Bogor also have an alternative tourist attractions relatively "new". The new destination is believed to be capable of knocking on the hearts and add insight to be able to live closer to nature. Exciting place to offer this time is Sindangbarang Cultural Village (Kampung Sindang Barang = KBS) and the Tourism Village Industries Cikaret (Kampung Wisata Industri Cikaret = KWC). Incidentally, the location of the two are not far from each other, there is a single route to the south of the city of Bogor. About 15 kilometers from the "Rain City", right at the foot of Mount Salak. To achieve both, the same must go through the intersection of South Pancasan in Bogor, then go to Jalan Raya Bogor-Ciapus, a road through the two villages, Pasir Eurih and Cikaret. Do not be surprised if the road quite narrow and crowded vehicles and housing. KBS is a complex of cultural tourism Sundanese Bogor, located in the village of Pasir Eurih, Tamansari District, Bogor Regency. Here, it can be viewed up close once lived in the houses of traditional Sundanese-style architecture. Chant rhythm classical Sundanese Bogor welcoming travelers entering the village this cultural complex. Only by paying Rp 600,000 - Rp 1,500,000 per night, travelers can stay at one imah (home) that can accommodate a maximum of 10 people. Available free breakfast for four people. At midnight, when the air is clear, fog-free, sparkling city of Bogor and Jakarta clearly visible. With a land area of ​​8600 square meters, the complex KBS currently there are 28 buildings. Indeed, in a traditional Sundanese village first, the buildings for occupancy and use pupuhu (customary chief), panggiwa (assistant expert pupuhu), along with kokolot (traditional leaders). The buildings were once used as a forum for their activities (and family) daily, as well as the wheels of government running a society or community of cultures, including conducting rituals / ceremonies. According to a pupuhu KBS, after an interruption of more than 32 years, indigenous traditions into a tourist attraction now beginning to routinely held. Some of them are Seren Taun. Some time ago, KBS Seren Taun event held for the fourth time. 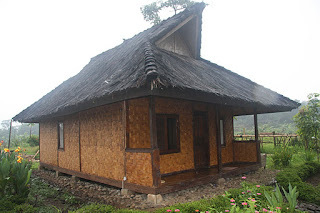 During the stay at KBS, tourists can enjoy while learning classical Bogor Sundanese arts, martial arts, or follow the villagers' daily activities, like farming in rice fields or pound rice. Interestingly, there is a tour package tracking archaeological heritage sites Sunda Kingdom (Pajajaran).